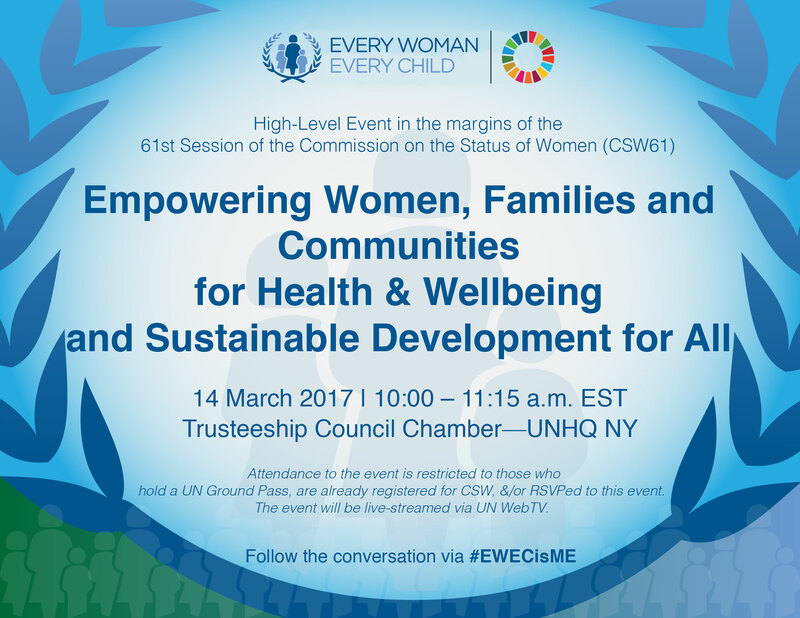 The Every Woman Every Child flagship event during CSW61 entitled, “Empowering Women, Families and Communities for Health and Wellbeing and Sustainable Development for All” will be held from 10:00 – 11:15 a.m. EST on 14 March in the Trusteeship Chamber at UNHQ. The event will be moderated by Dr. Flavia Bustreo, Assistant Director-General Family, Women’s and Children’s Health, WHO. Please note, attendance to the event is restricted to those who hold a UN Ground Pass, are already registered for CSW, &/or RSVPed to this event. For those who cannot attend in person, they can tune in for the live-stream via http://webtv.un.org/ during the event.